Newcastle boss Rafael Benitez has told his players to forget about revenge as they attempt to edge themselves closer to Premier League survival at Wolves on Monday evening. The Magpies lost 2-1 to Nuno Espirito Santo's men in controversial circumstances at St James' Park on December 9 with Matt Doherty's late header securing the points as Ayoze Perez lay prone in the opposition penalty area after being caught by Willy Boly's flying elbow. He said: "We knew after the game watching the replays that everything was wrong and we didn't deserve to lose the game, but we cannot change that. "We have to concentrate now on this one. "It's an opportunity for us because every game for us is a final, so this is the first one and we have to play all the finals with everybody concentrated and focused on that." The Magpies sit in 15th place in the table, two points above the relegation zone and knowing the chasing pack could have closed significantly by the time they run out at Molineux. Wolves, who emerged from the Sky Bet Championship the season after Newcastle made the same journey, have prospered in the top flight and headed into the weekend sitting seventh and with 38 points to their name. 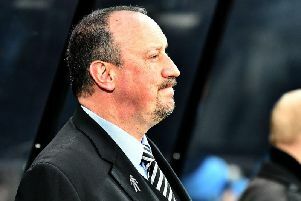 That has come as no surprise to Benitez, who has looked on enviously as Espirito Santo has been able to invest heavily in his squad, although he could hand record signing Miguel Almiron a debut after owner Mike Ashley finally loosened the purse strings last month. Benitez said: "They are doing well. They have a good manager, they have very good players. "We talk about the newly-promoted teams, but they have spent more than £100million, some of them, so it's not the same as when you have another promoted team, for example like Huddersfield, who spent some money, but still there's a big difference. "If you see the players that they have, they have champions of Europe, they have players who play at international level. "They are a good team doing really well."